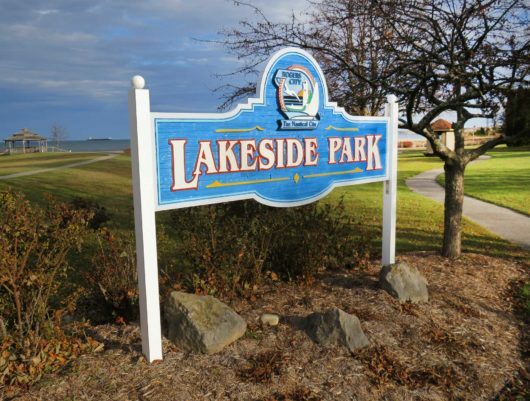 When you approach Lake Huron from downtown Rogers City, you easily find yourself at Lakeside Park. And, as the logo says, Rogers City is “the nautical city.” There’s a rich history here of mariners and all manner of watery endeavors. But there’s a lot of digging going on here too. 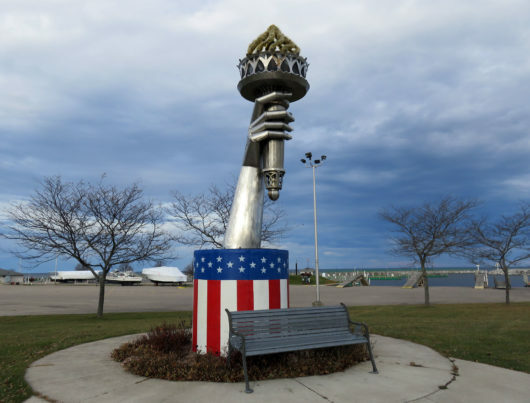 This “Liberty Torch” welcomes visitors to the park and marina. Tom Moran, of Moran Iron Works in Onaway, fabricated it in 2004. In late November, we had Lakeside Park all to ourselves. The park benches were empty. Our butts were the only ones in the gazebo seats. From the gazebo, you look out onto the breakwater. 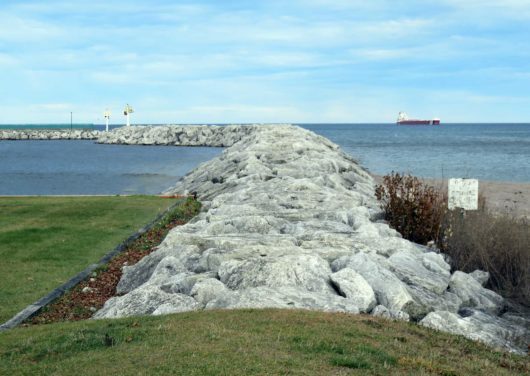 I’m thinking that breakwater is mostly constructed of limestone. My rockhound days are behind me so I don’t know that for sure. But Rogers City is also the Limestone City. 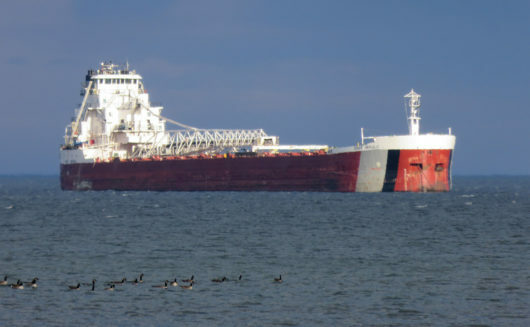 Here’s a closer look at the freighter that was anchored offshore, beyond the breakwater. This freighter is the “Great Republic.” That’s what it says in lettering in that white area just above the gray and black vertical striping. 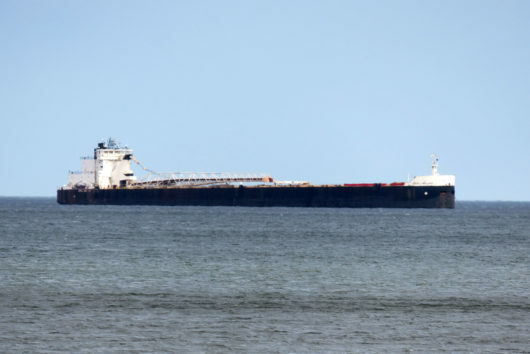 It used to sail, if that’s the right term for a ship with no sails, as “American Republic.” But in 2011 a lease expired and it was re-named the “Great Republic.” You can read all about this freighter here. It launched in 1981. It’s highly specialized and tricked out to handle rock and ore-carrying duties. It’s considered to be one of the most maneuverable ship on the lakes, with eight rudders, bow and stern thrusters, and variable pitch propellers. I don’t know anything about freighters, but eight rudders is seven more than any boat I’ve been on. It’s a “self-unloader” and can carry 1000 tons more than freighters of similar size. Honestly, it just looked like a clunky big freighter to me. But it turns out that it’s 641 feet and 10 inches of special. That flock of Canada Geese probably knows it’s special. That’s why the whole gang decided to paddle by for a closer look. The Great Republic was anchored. We assumed it was waiting to load up or unload at the Calcite plant nearby. The “John J. Boland” was also at anchor, a little closer to the plant. It’s another self-unloading bulk carrier. It launched in 1973 as the Charles E. Wilson. Boatnerd says that it was renamed in January of 2000 after the first Charles E. Wilson was sold and started sailing as the Saginaw. I knew nothing of all this name-swapping stuff. And I don’t know who Wilson was or is or who Boland was or is, but apparently they got their names welded onto another pretty specialized freighter. This one has an adaptable digital gyroscope steering-control system and is described as a vessel with very few mishaps. It’s 680 feet long and can carry 33,800 tons of stuff. So, having very few mishaps is a comfort to those who work aboard. Here’s the historic site sign that stands near the gazebo at Lakeside Park and explains why these freighters are all lined up.That’s hard to read, so I’ll tell you the main points. 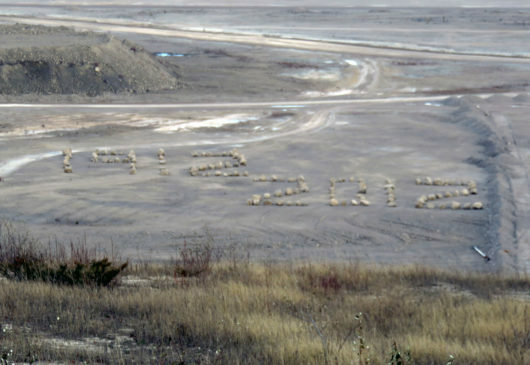 The sign explains that “since 1912, the skyline south of Rogers City has been dominated by the buildings, machinery, and storage piles of the Calcite Plant, the world’s largest limestone quarry operation.” The world’s largest. Right here in our backyard. There’s a bit of puffing about what accounts for the humungous success of the operation. And we learn that the company started out as Michigan Limestone and Chemical Company. It was founded by a New York investment banker, William F. White. But the company’s general manager, Carl D. Bradley, is the guy who ended up being dubbed the “Limestone King.” He died in 1928. You may remember something about Carl D. Bradley that doesn’t get mentioned on the sign. A freighter bore his name. It was the largest freighter on the Great Lakes from 1927 to 1949. In November of 1958, the Carl D. Bradley sunk in Lake Michigan. It broke in two during a fierce November storm. Thirty-three men died. Twenty-three of them were from Rogers City. Fifty-three children were orphaned. Two crew members survived. There are many places to read more about the shipwreck, including here and here. But the sign at the park’s gazebo isn’t the place for a memorial. 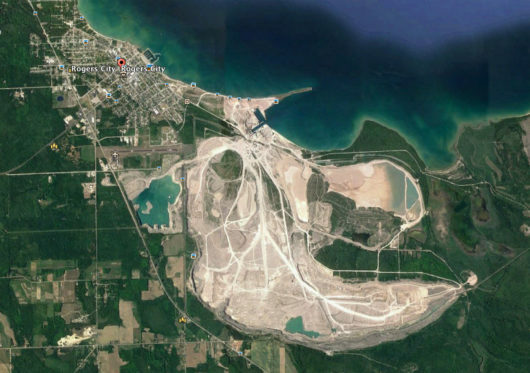 U.S. Steel bought the Michigan Limestone company in 1920. 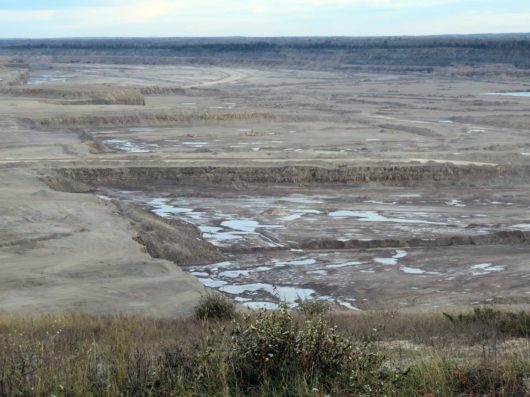 Carmeuse Lime & Stone, a Belgian Company, bought the Calcite operation. That’s who owns it today. 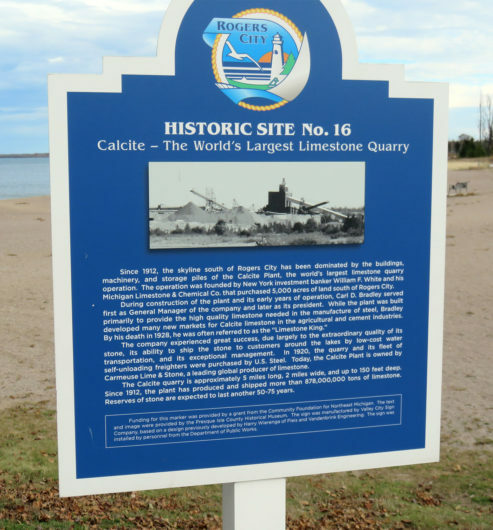 The sign at the gazebo says that since the mining started in 1912, the Calcite quarry has produced and shipped more than 878 billion tons of limestone. The estimate is that its stone reserves will last another 50-75 years. 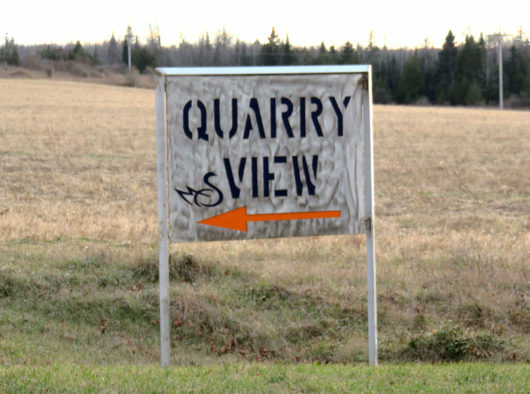 The sign says that the quarry is 5 miles long, 2 miles wide, and up to 150 feet deep. Little Rogers City is dwarfed by the Calcite quarry and plant. The freighters in the photos were anchored just north of the peninsula that frames the bay above that “v” of green grass south of town. If you head out south from town on Business 23 you can meet the Calcite Quarry a little closer than at a satellite height. Turn left into the parking lot at this plywood sign. Don’t be misled by that little “M” and “S” squiggle. There are no swans at the Calcite Quarry. The day we visited no one was at the viewing site. We climbed metal openwork stairs to get a better look from a platform height about six feet above the parking lot. 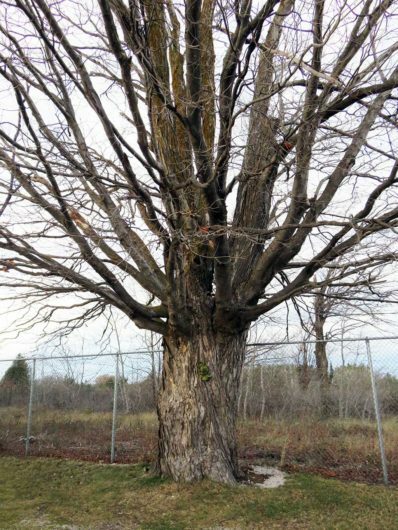 This ancient tree guards the parking lot. It’s really hard to convey the scale of this tree. That little greenish “growth” just below the branches to the right of the middle of the trunk isn’t a fungus or a glob of moss. It’s Steve’s baseball cap. I hung it on a piece of tree bark to try to show the scale, but the tree trunk just gobbled it up. And Steve has such a big head that he typically buys his hats at Big Head Caps. This tree’s trunk is about 5 feet across. This tree is so big it was probably shading picnic-goers back in 1912 when the Calcite Plant was just a gleam in Carl Bradley’s eye. So, you climb the steps and look down into a gash so deep and so wide that it rivals the Grand Canyon. If you haven’t seen this, go look. This photo can’t begin to show the enormity of the quarry. Eight-hundred-seventy-eight billion tons of limestone came out of this hole. These gigantic limestone boulders must have been rolled into place to celebrate the quarry’s 100th anniversary. Those are roads down there. Workers drive huge mining equipment and trucks on those roads. They pass each other on those roads. Generations of quarry workers dug this big hole. It’s not pretty. Not from space and not up close. But it’s impressive. Go see. This entry was posted in Michigan's "Up North" and tagged Calcite Plant, Carmeuse Lime & Stone, Great Republic freighter, John J. Boland freighter, Michigan Limestone & Chemical Co, Moran Iron Works, Photos by Steve Thorpe, Rogers City, Tom Moran by Noreen. Bookmark the permalink.